Reliance Jio has decided to withdraw its Summer Surprise offer after telecom regulator Trai advised the teleco to do so, according to a report of ET Now. 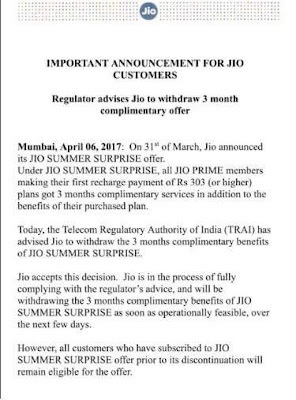 On March 31, in a surprise move, Reliance Jio which was expected to charge for its services from April 1, 2017 extended the deadline for buying Jio's Rs 303 (and other) plans till April 15, 2017, and according to its new scheme, the subscribers who buy Rs 99 Prime membership till April 15, 2017 with a plan of Rs 303 or higher will be eligible for the Summer Surprise offer. Under the offer, its subscribers are entitled to get free services for next three months, starting April 15. The new telecom player, a part of oil-to-logistics conglomerate Reliance Industries Limited (RIL) had on September 5, 2016 launched commercial telecom services under a three-month promotional Jio Welcome offer which in December extended as Jio Happy New Year offer till March 31. 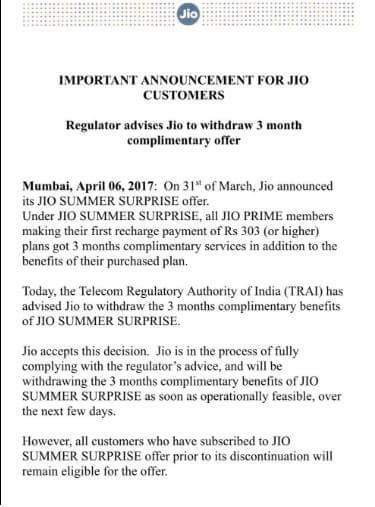 Reliance Jio added that it accepts this decision.